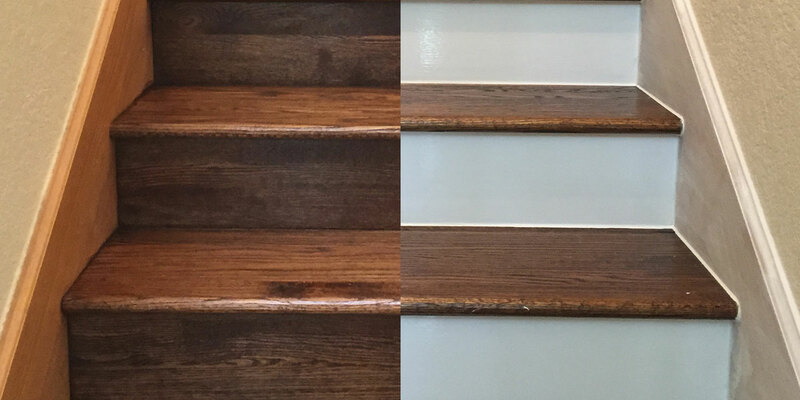 In Dallas – Fort Worth and the surrounding areas, a popular trend is for homeowners and businesses with new or recently refinished hardwood floors and stairs to paint the stair risers. Many homeowners feel this is a painless expense and a practical improvement with benefits. White risers tend to highlight the natural wood stairs but also make the staircase and surrounding walls look more spacious. Whether you choose to paint the risers yourself or opt to hire a contractor, be sure these steps are followed for best results. Before beginning the job, contact your local waste removal provider and inform them you will have excess paint, cleaning chemicals and scrap. Comply with their instructions for storage and disposal. If you need a contractor to paint your stair risers or refinish your hardwood floors, contact Hardwood Floors Fort Worth. We have trusted providers who are cost effective and fully insured. In Fort Worth – Dallas, Hardwood Floors Fort Worth customer service has answers to all your flooring questions.